Have you ever wondered why we use safe words in this lifestyle? I have pondered that a time or two and have always come to a conclusion that it is what makes this lifestyle safe. Without them, we are bordering on harming the other person if we go too far. It is important to develop a safe word system with your Dominant. There are many reasons why this is such a very good idea. What about using the stop light system? Red light means stop. Yellow light means slow down. Green light means go. This system is used in many dungeons and play parties across the globe and for many it works. What about for the people it simply does not work for? Or they feel it is too easy of a system to use improperly? You have to find a system that works for you in the long run. This system of the stop lights is universally acknowledged. Some feel that using non-personalized safe words is opening up a can of worms. It takes a certain level of trust to develop a bond and safe word system that works for their particular dynamic. I know for me I would much rather use a one or two-word safe word rather than the traditional stop light system. Why? For me, I feel safe knowing I have this system in place that my Dominant will understand and that he knows I will use when need be. I like a word or a phrase I will use not just on some whim because I’m just not feeling it that day. I have to make a conscious effort to use them because it isn’t something commonly used in everyday conversation. It isn’t something I am going to use just because I don’t want to do something. It has always prevented me from using it in an improper manner and my Dominant knows I am being serious when I use it. It is a conversation that every dynamic need to have at the beginning of the relationship. What are some proper times to use a safe word? Can you think of some yourself? When the pain or scene is too intense for you. When you feel afraid of what is going on. When you have a question about what is going on. When you have taken all that you feel capable of enduring. When something has triggered a memory that is painful or scary to you. When something feels a bit off to you – be it mentally, physically, or emotionally. When something in the scene has pushed past a limit of your comfort zone. What do you do about those times that a submissive is in a head space where they may not be able to properly communicate a safe word? Those are the times where the Dominant and submissive have to rely on other cues that something isn’t right. Watch for facial expressions that show distress, phrases that keep being repeated over and over, and signs of mental, emotional, or physical distress. This is very important that both parties key into these things. Communication is so important and key here. Should a submissive be punished for using a safe word? It is my opinion that they should not be. Others may disagree with me on that. 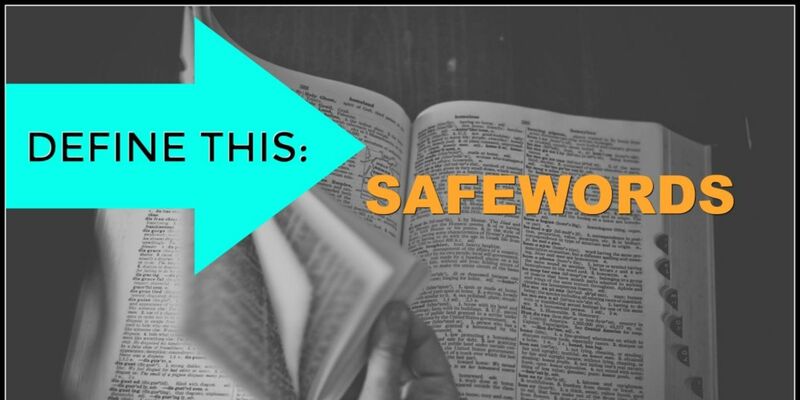 What about crying wolf – using the safe word when they really do not need to? Who can say that it is not needed except for the submissive? A submissive does need to keep in mind not to use a safe word casually. There are times when a submissive is having an off day or having an off experience with a scene. He or she needs to properly communicate this with their Dominant. It is then up to the Dominant to determine what the next course of action should be. Whether or not to proceed with the planned scene or change it to something else entirely. This is important for both parties involved to realize and act upon. There are times that a submissive may feel reluctant to use a safe word because they fear their Dominant may not approve of its use or may feel it might come under the “cry wolf” clause. Never be afraid to speak up and voice what is going on for you. Only you know what is going on inside your head space. Dominants are not mind-readers and they are relying on our open and honest communication skills. A dominant relies on that to know how to proceed in most situations. 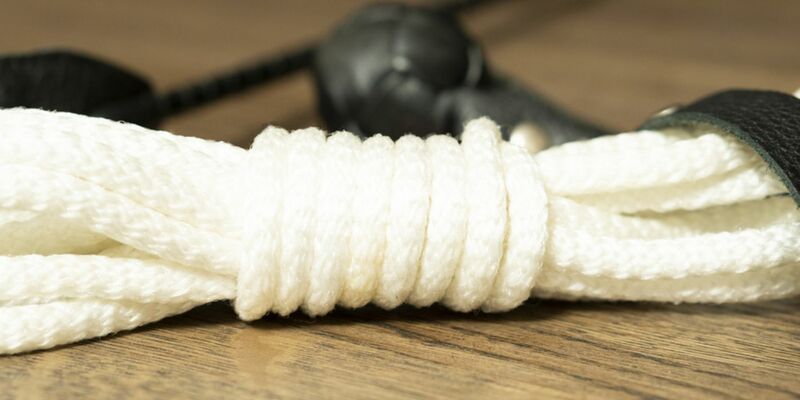 Consider the use of your safe word as a safety net for when you’re in over your head and unable to proceed. Most Dominants, if not all, will understand the use of the safe word and will make adjustments accordingly. If they don’t then you really should think about whether or not this person is safe to scene with. It is harmful if a Dominant ignores your safe word. Safe words have a clear and definite purpose in the relationship. For me using a safe word has always been about open communication with my Dominant. If I am unable to continue with a scene in the way it is being presented then I need to speak up. It is important because a boundary could be crossed that I’m not prepared to deal with the aftermath of just yet or perhaps could be felt a trust was broken. Either of these things could be a bad thing in the long run. I have to be prepared to use the agreed to safe words should the moment arise. What are times you wouldn’t use a safe word? Can you think of some? When you are being punished for an infraction. Please note that not all dynamics are like this – this is simply my experience. When something is not hurting you – be it mentally, emotionally, or physically. When a boundary or limit is not being pushed. When you are simply having a normal conversation that is not heated. Why would someone use a safe word when it isn’t needed? It isn’t cute. It isn’t smart to do so because it is “crying wolf”. Sometimes this is done as a test, but it is never a good idea to do this. A dominant relies on you to communicate honestly and effectively. How are they going to know you are doing so if you simply use the safe word just because? Think, think, and think before using it. If you’re having an off day please tell your Dominant this before you begin to scene. That is something I can not stress enough to an old or new submissive. Something so little and so easy to do is something so complex sometimes. It isn’t always easy to know but you have to follow what is in your head and heart on this one. Never be afraid to say your safe word. It is your safety net. In closing, I would like to say that using your safe words properly and effectively is important to the dynamic as a whole. It allows the two of you to grow and expand horizons together. It, also, adds to the trust between the dominant and the submissive, which in turn, will heighten the experience. It is such a wonderful thing and doesn't let this become a point that dampens the experience. Don’t be afraid to ask questions. Don’t be afraid period.